Where Do You “Aim” and Why? One of the first questions I ask shooters is where do you “aim”. As we progress, I tend to use the term holding area. “Aim” to me, means “point at a spot”. Back to asking the question. It amazes me and some other coaches, that the answer usually comes back “exactly half way in the six ring” or they point to a location on the target and say “right there”! I then ask, if you fire a shot in that exact point where would the shot be on the target? They answer that it would be a central ten. What if the sights were half a scoring ring higher, I ask? Then it would be a high 7, they answer. What about if the sights were half a scoring ring lower? Then it would be a low 7, they answer. 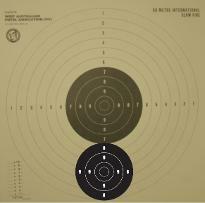 Looking at the target, I notice that the distance between the scoring rings are 25mm on a precision target. This would mean that the shot fired half a scoring ring higher, should have been only 12.5mm higher from centre. But why would you presume it would be a high 7? Perhaps it's the perception of movement the shooter observes when they fired the shot? The size of the 10 ring is 50mm. 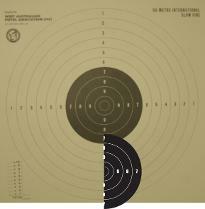 This indicates that the shooter could fire a shot from the 6 ring to the 4 ring and still shoot a 10. It is also presumed that the shot fired is done with the sights perfectly aligned and a correct trigger press is achieved. This means that the sights are not disturbed during the execution of the shot. After all that explaining, we can see that the entire white area under the black is the same size as the 8 ring. So if the sights are anywhere within this area, given that the sights are aligned and correct trigger movement, it should be in the same “area” on the target. Now comes the expression coaches use, “area”. This being area of hold, area of aim, but it is just that, an area you are able to hold the sights in alignment on the target. Newer shooters will find it difficult to hold and area as small as the 9 ring but seasoned shooters would find it easier to hold the 9 ring or even smaller. So, what have we deciphered from this? 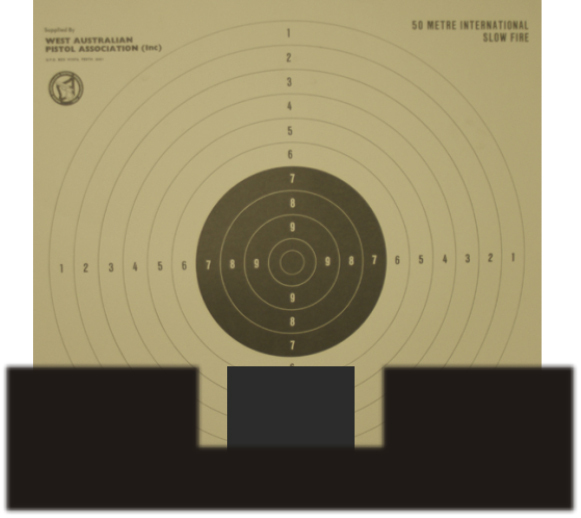 It is recommended that shooters hold in an “area” under the black. Allowing enough space between the base of the black so not to become distracted in the attempt to get that exact “aim point”. Allow the pistol to “find” its own area of hold whilst maintaining correct sight alignment and smooth trigger press. 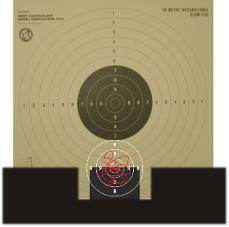 Diagram 1: Shows the sights at that exact aim point halfway between the six ring. Diagram 2: With the black cut in half, the measurements show the size of the 10 through to the 7 ring. Diagram 3: The total size of the white under the black, is the same size as the 8 ring. Diagram 4: Showing the area the sights may move somewhere under the black. Also known as the area of hold. 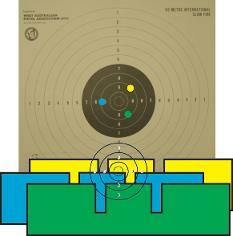 Diagram 5: Random sight pictures with shot placements.